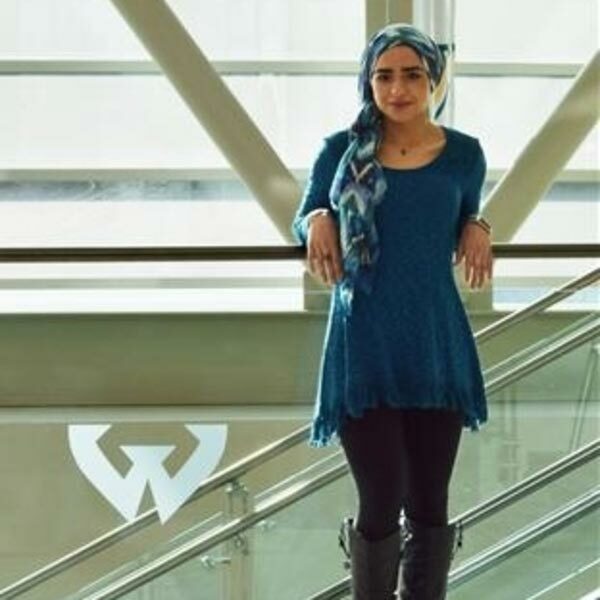 Sophomore Dalia Ibrahim is working to make an impact at Wayne State before she goes on to change the world. Ibrahim, a political science major, has dedicated much of her time as an undergrad to helping marginalized populations both on and off campus. With a small group of students, Ibrahim started the WSU organization Help the Homeless to provide assistance to Midtown’s homeless population. "It actually started in my American government class. We were asked to tackle a social problem and the homeless population in Detroit was — and still is — a pretty pressing matter." Ibrahim was disturbed by the number of people she heard speak negatively about homeless inpiduals, which drove her to further her efforts. "I want to get rid of the stigma that these individuals are 'lazy' or somehow less deserving of our compassion. We need to be willing to help people and give them the benefit of the doubt." It's not necessarily about changing the world, but trying to make things better for a few people. With Help the Homeless, Ibrahim has been able to help create over 100 care packages containing essential items to give to the homeless in the Detroit area. "We know it's a much bigger problem than a group of college kids can tackle. It's systematic, institutional and it's not going to change anytime soon. We just wanted to try and make some kind of impact, so we decided to make care packages," said Ibrahim. "It's small, and it isn't solving the root of the problem, but at least we are treating some of the symptoms. It's not necessarily about changing the world, but trying to make things better for a few people." Ibrahim has also been working to collect and expand women's accessibility to resources on campus. "Originally we wanted to create a center that could provide these services directly, but realistically, we are aiming to utilize the resources already available on campus." Fighting for the rights of others has been a leading motivator for Ibrahim, who decided to make a career of it when she was only 6. "I always knew I wanted to be a lawyer. I wanted to solve conflicts. With my upbringing, international affairs really interested me. I've always had that insight that there are other people in the world." Being a first-generation American, Ibrahim had a broadened worldview since childhood. After the sudden passing of her father when she was in middle school, Ibrahim reflected on the pain she felt from that loss and applied it to her path in life, deciding to be a human rights lawyer. "The pain I felt after losing my dad was monumental. He was the most important person in my life." said Ibrahim. "But I've grown a lot from the experience and it has made me want to help people that much more." Ibrahim firmly believes that it is her mission to help people, and strives to do whatever possible to improve the lives of others. "The playing field is not going to be equal, but it's our job to try and help as much as we can. I see what's going on all over the world and even though their lives have nothing to do with mine, they are still human beings. They're people; they have families, they have dreams and goals and aspirations. We have to be mindful of that." Above all else, Ibrahim wants everyone to feel comfortable, safe and welcome. Her philosophy is that everyone wants to feel cared about and that no one is above anyone else. "This is an amazing place for that. Wayne State and Detroit are whatever you make of them. I want people to know that they're not alone in their endeavors and that no matter who you are, you are welcome here. This is your home, too. No matter your gender, age, race or income, I want you to feel safe and welcome here."